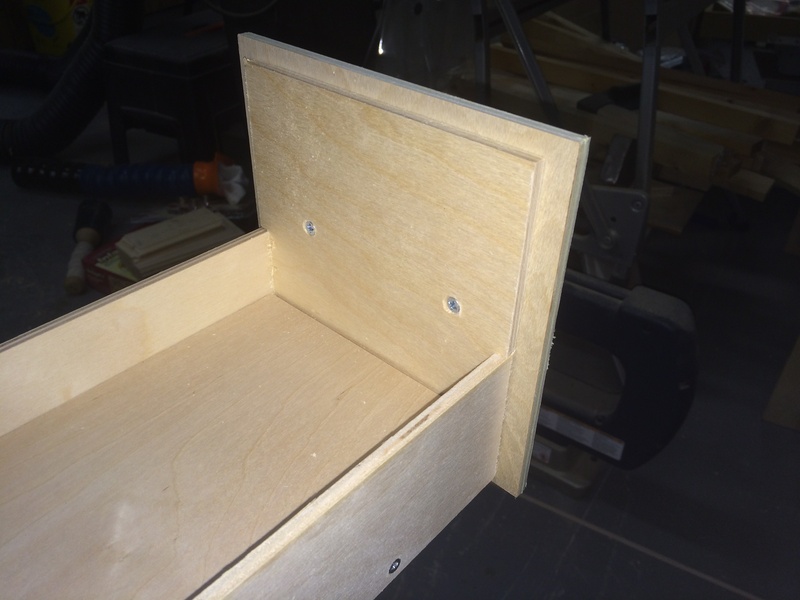 The bottom and back are cut to width, just about the width of a dime less than the width of the drawer slot. I want to make sure the drawer won’t bind, and at the same time don’t want to make them so loose that they will bind easily. The back is measured and cut to be just about the same dimes thickness from the top. The back will keep the drawer from tipping forward when opened. I then cut a 1/4″ piece to fit the front opening (after trimming the bottom to the length of the slot (less the thickness of the front piece). I didn’t measure these, I set the fence on the table saw to the length of the drawer (using the actual pieces of the drawer). I then use the front piece as a spacer off the fence to determine how much to remove. I actually fit it loosely, rather than snuggly so that a hair more is removed than is required. Again, I’m looking to be close, but just under the depth of the slot. The sides are inset, and the process I used was probably not for the weak of heart. I space the fence out from the blade using the drawer (with the front and back attached). The sides are about 3 1/2″ high, which is about as high as I can raise the blade on my saw. Using 1 side as a spacer on the fence side, I can run the drawer over the saw to get a vertical (and straight). I *do* have respect for the blade – and I do make sure the fence is parallel to the blade before beginning. And I do use a “gripper” as a push block to keep my hand up and way from the business end of things. 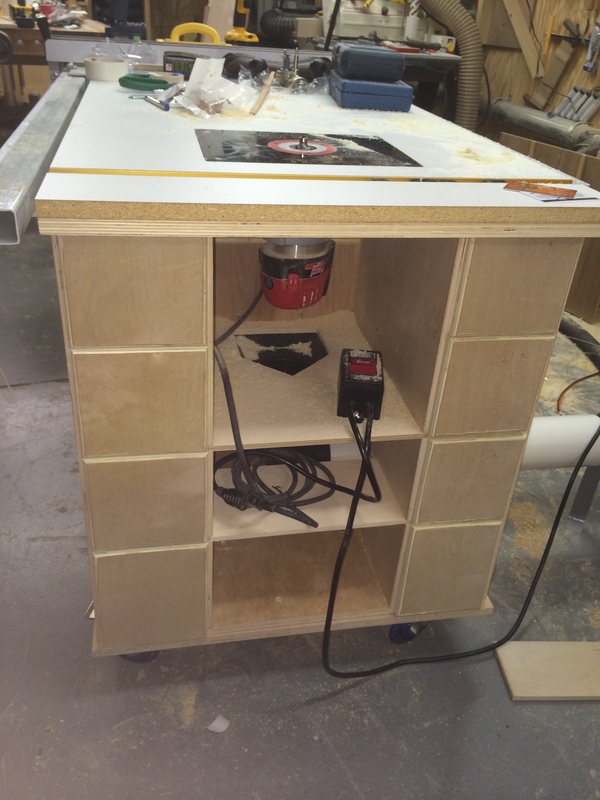 The cut up the front and back of the drawer is chopped out with a chisel, and the side fitted and screwed in. Then I simply repeat the process on the other side of the drawer. The false fronts where measured in place, then cut and I routed down the edges. All that remains now is to attach the center panel for the router bay (and figure out what I want to do with the two center slots below the bay.